Last weekend’s Super Smash Bros. for Wii U competition at DreamHack Montreal came down to a nail-biting grand finals match between Larry “Larry Lurr” Holland and Eric “ESAM” Lew. With his tournament hopes on the line, Holland scored a clutch counter against Lew to reset the bracket, which was made only more impressive by the fact his character wasn’t visible at the moment his fortunes were reversed. Thanks to an early finals loss, Holland had to claw his way to grand finals through the losers bracket, and would need to overcome two best-of-five sets to take the tournament. Lew, on the other hand, had to win just one, having come into the event’s closing match via the winners bracket. After four games, Holland and Lew entered their fifth tied at two wins apiece. 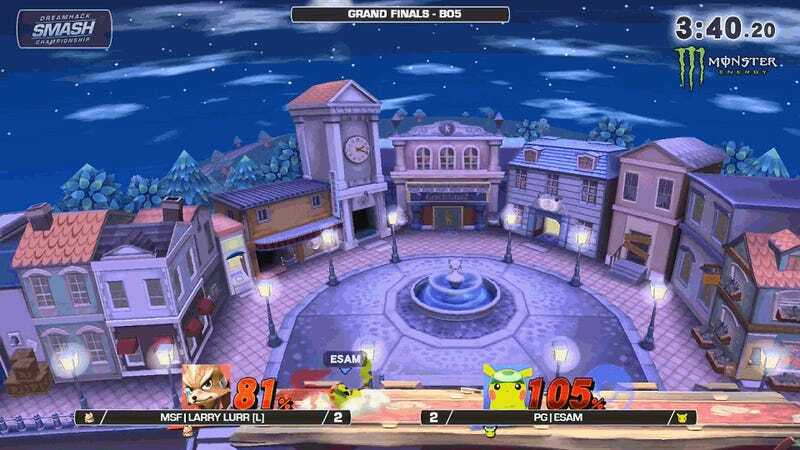 As the match came down to its final stocks, Lew landed a sneaky Quick Attack with Pikachu that sent Holland’s Fox into the air, chasing him down with successive aerials that pushed Fox further towards the upper parts of the screen and threatened to eliminate him from the tournament entirely. Holland attempted to avoid Lew’s pressure with the Reflector special move, which is capable of countering attacks and adjusting Fox’s mid-air momentum. It didn’t work. Pikachu’s strong air game proved just too much to handle. But, as Lew went for the kill with a devastating Thunder attack—a special move where Pikachu calls forth a huge lightning bolt from the air—Holland threw out a last-ditch Reflector, even though he was unable to see his off-screen character at the time. As the Thunder hurtled down towards Pikachu, it soon became clear that it didn’t quite belong to him anymore. While the attack typically connects with its user harmlessly, Fox’s Reflector turned the lightning against the electric Pokémon, amplifying its damage and shooting Lew towards the stage’s upper KO area. Holland lived to fight another day, resetting the bracket and gaining equal footing with Lew in the next first-to-three set. Afterward, they shared a knowing nod. The play had been amazing. This incredible moment turned the entire tide of the match. Where before he was on the verge of elimination from the tournament, Holland seemed reenergized. In their next set, Holland closed out the grand finals with an impressive 3-1 showing, winning his first major tournament since Mexico Saga in June 2016. For more Super Smash Bros. for Wii U action from DreamHack Montreal, be sure to check out the official Twitch archive.